Before a business can even think, blink or wink, customers can decide a product’s fate with a click. That’s why it is vital for businesses to anticipate and cater to what the customer wants and deliver it on time, as shortage of product and/or delivery delays almost always equate to lost sales. The world’s largest home furnishing retailer IKEA has 298 stores in 37 countries. Each IKEA store is huge and holds more than 9,500 products. How is it that their products are rarely ‘out of stock’? TradeGecko attributes this to IKEA’s unique supply chain and inventory management techniques. 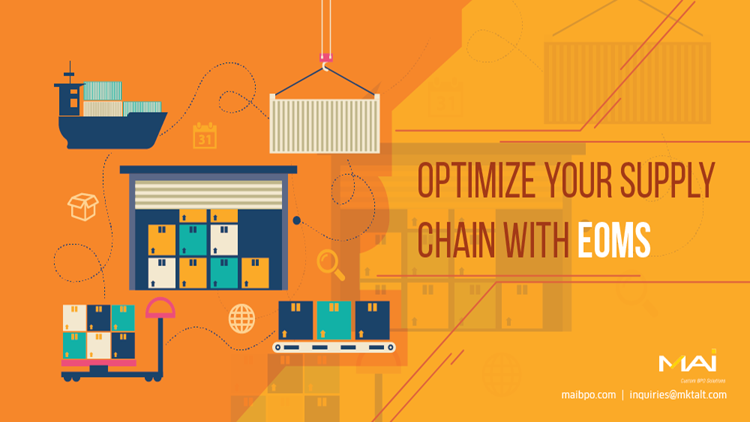 Having a good Enterprise Order Management System (EOMS) can help optimize productivity in a supply chain. Enterprise Order Management System (EOMS) is a software system that tracks and reports various elements of a supply chain like inventory, orders, sales, distribution, stock, etc. Optimizes inventory: An EOMS can track data related to past sales and inventory records. This data combined with sales forecast can help optimize the right inventory levels. Real-time inventory visibility: The EOMS provides details on what is currently available, expected time of new arrivals and customer orders in the pipeline. Though it may seem cliché, it is true that consistently delivering on promises earns customer satisfaction and loyalty. Decision making : Stake-holders and executives can access the software via mobile, PC or laptop which, in turn, allows them to take informed business-wise decisions. Data security : Data security risk is a ‘zero’ compromise area for most businesses. Restricted user rights feature helps managers to mask confidential or important information. Control order movement : In a large scale order scenario or peak-season demand, it may be essential to control stock owned by supplier or distributor stores. An EOMS helps view availability held across all tiers while also accounting for the customer orders in pipeline. Lowers online shopping cart abandonment rates : A research on abandonment reveals that 39% transactions are abandoned due to “out of stock” and 17% as the delivery times is unclear. Regulatory requirements: Certain sectors such as food, chemicals and pharmaceutical drugs need to satisfy regulatory requirements for storage conditions, formulations, fumigation, etc. An EOMS offers tools for tracking and reporting such information. Savings: Inventory is a major asset. Efficient and effective order management helps minimize unnecessary expenditure on stock as well as warehouse space. Similarly, it helps maintain enough stock in hand to meet demand thereby saving a lost sale. Purchasing advanced EOMS software could be out-of-reach for a small company. Instead of investing in expensive hardware and IT staff, you can opt for cloud inventory management software. In this case, the service provider will be responsible for maintaining the EOMS on the cloud. Businesses have an option to subscribe on a monthly or yearly basis. This allows small businesses to upscale as they grow.